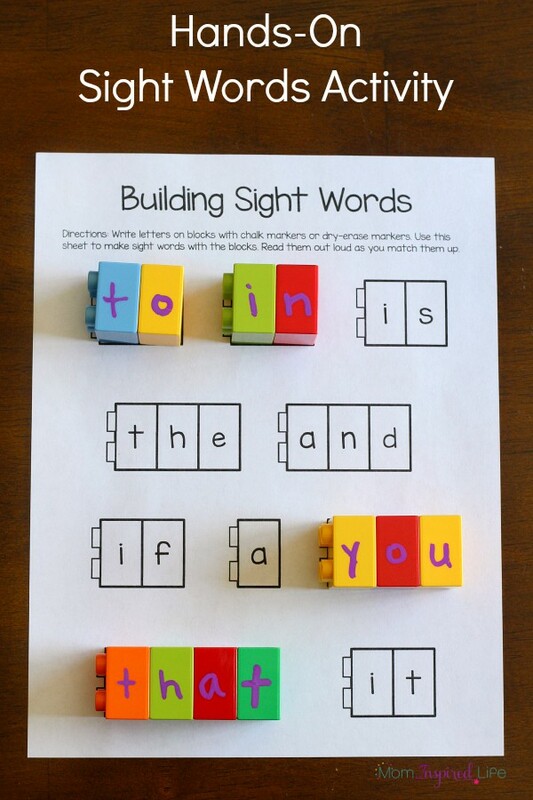 I have just started teaching my son some sight words and this building sight words activity with printable matching sheets has been awesome for him! 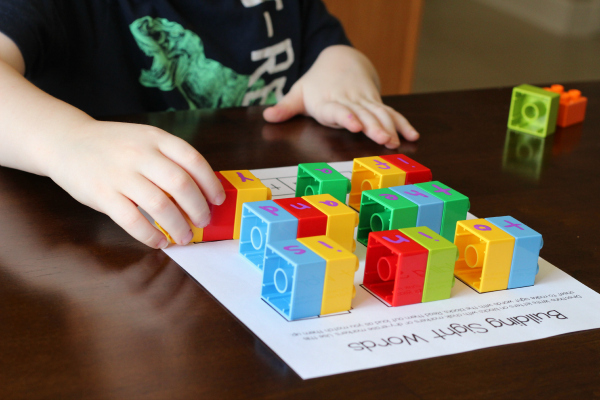 I was looking for a fun way to begin teaching sight words and I came across this really neat activity that used Mega Bloks to build the words. We didn’t have enough Mega Bloks to make many words, so I decided to use our Duplo blocks. 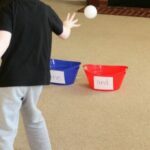 We have plenty of them and they are also an excellent way to add some fine motor practice to the activity as well. 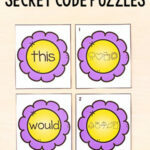 I knew I wanted to make a printable for him to use as a guide because he is so new at learning sight words. My Duplo patterning cards have been a big hit with him, so I thought a matching sheet similar to that would be perfect for him. 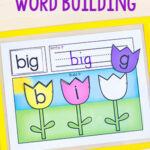 It also gives him a way to check to make sure the words are spelled correctly. 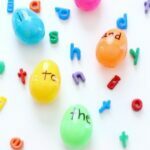 I used the Fry Word List and I’ve made Building Sight Words printable sheets for all of the 1st 100 words. That includes Set 1, Set 2, Set 3 and Set 4. *You could also use permanent marker. It comes off if you trace over it with dry-erase marker. Test a block first to be sure. Or you could simply leave the letters on permanently if your children have outgrown Duplo and moved on to regular bricks. Dry-erase markers will rub off fairly easily, so I prefer to use my chalk markers. Print out the sheet you want to work on. Grab a bunch of the 2 x 2 bricks and turn them sideways. 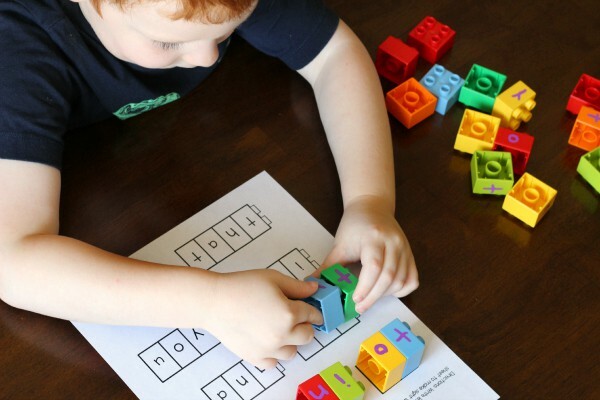 Write one letter on each brick until you have enough to make all of the words on the page. I showed Evan the sheet and the Duplo blocks with letters on them. 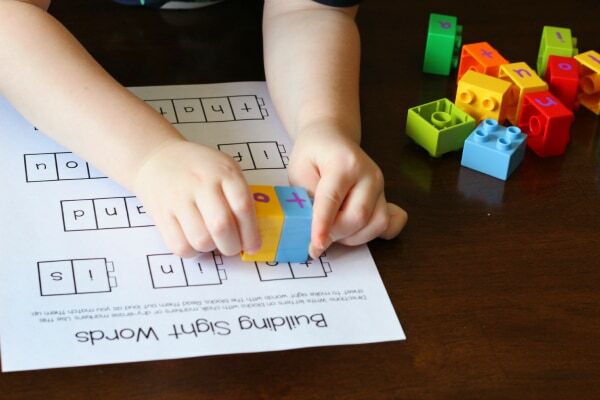 I then modeled what I wanted him to do by looking at the first word on the sheet, finding the bricks needed to make the word and then putting them together to spell the word. I then matched it up to the sheet. He was very impressed by this and was eager to make his own word. He chose another word and then started looking for the letters he needed. Once he found the letters he had to work out how to put them in order correctly. Then he matched it up to the sheet. Afterward, we worked to sound out the letters together and repeated saying the word a few times. We continued through the whole sheet and Evan really enjoyed it! He even wanted to do another sheet. 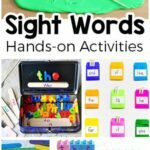 I think this going to be a great, hands-on way for him to learn sight words! 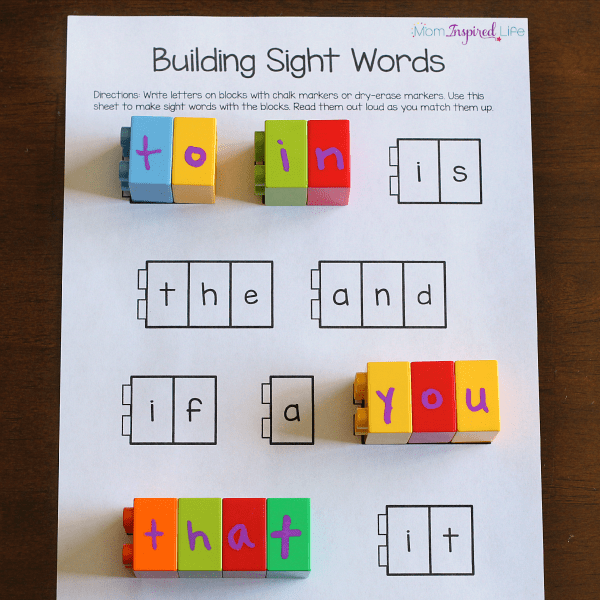 Download Set 1 Building Sight Words sheets by signing up for my newsletter! Once you enter your email address and click subscribe, you will get an email with a link to download the sheets. This set includes the first 26 words. To purchase the whole pack with all of the first 100 words, head over to my shop. Don’t miss a chance for special bonuses, pre-order details, and more fun by signing up to our newsletter right away! 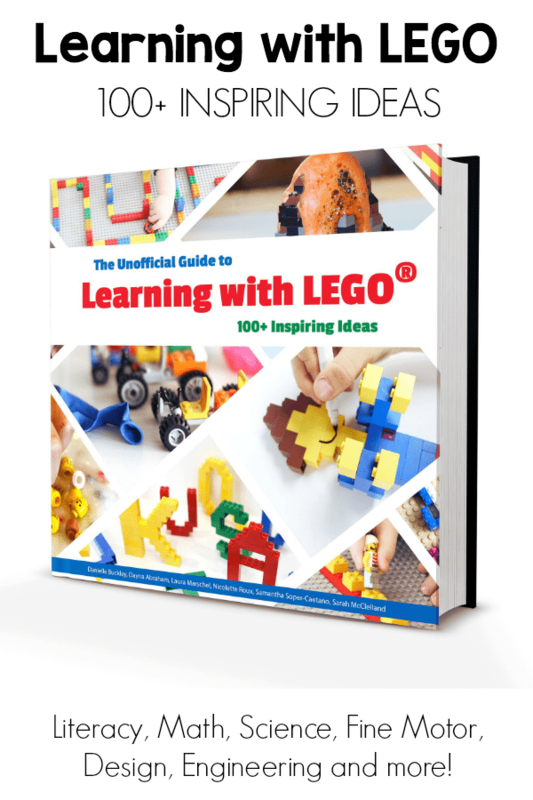 Get 25 free LEGO challenges when you sign up for our book newsletter right now. 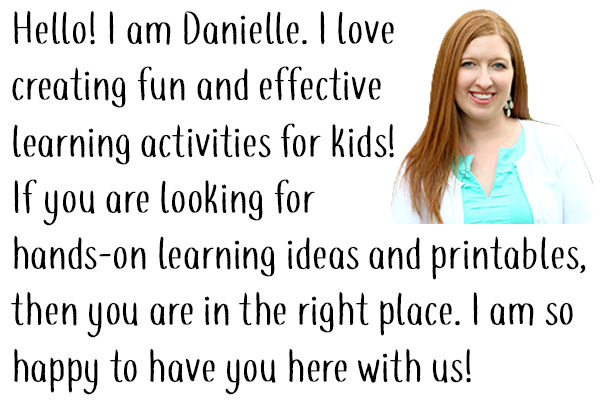 Click the image above to sign up! 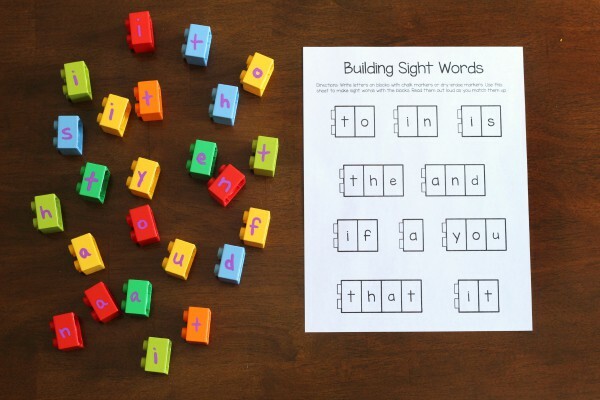 Sight Word Activities that Your Kids Will Love! 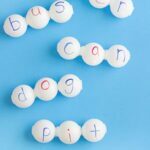 Building Words with Ping Pong Balls is Super Fun!